Shipping lanes through the Arctic Ocean won’t put the Suez and Panama canals out of business anytime soon, but global warming will make these frigid routes much more accessible than ever imagined by melting an unprecedented amount of sea ice during the late summer, new UCLA research shows. “The development is both exciting from an economic development point of view and worrisome in terms of safety, both for the Arctic environment and for the ships themselves,” said lead researcher Laurence C. Smith, a professor of geography at UCLA. The findings, which explore accessibility during the Arctic’s most navigable month of the year, September, appear in the latest issue of the scholarly journal Proceedings of the National Academy of Sciences Plus. The first thorough assessment of trans-Arctic shipping potential as global temperatures continue to rise, the study is based on independent climate forecasts for the years 2040 to 2059. “We’re talking about a future in which open-water vessels will, at least during some years, be able to navigate unescorted through the Arctic, which at the moment is inconceivable,” said co-author Scott R. Stephenson, a Ph.D. candidate in the UCLA Department of Geography. 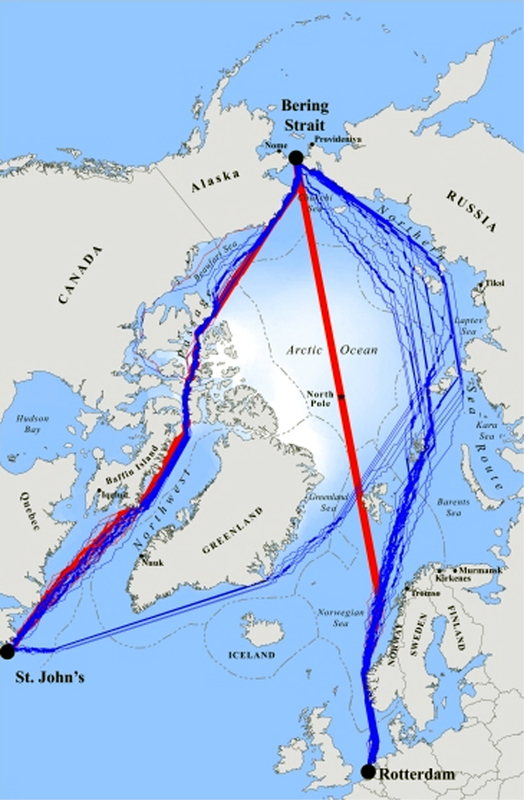 The route directly over the North Pole is 20 percent shorter than today’s most-trafficked Arctic shipping lane, the Northern Sea Route, which hugs the coast of Russia. For vessels traveling between Rotterdam in the Netherlands and Yokohama, Japan, the Northern Sea Route is already approximately 40 percent shorter than the traditional route through the Suez Canal. Even the fabled and notoriously treacherous Northwest Passage, which traces Canada’s coastline and offers the most direct route from Asia to eastern Canada and the northeasternmost part of the U.S., is expected to become more viable for Polar Class 6 vessels — a common type of ship that has been strengthened against ice — and possibly even ships with unreinforced hulls, which make up the lion’s share of the world’s commercial fleet. Today, the Northwest Passage is theoretically navigable only one out of seven years, on average, making it too unreliable to be a viable option for commercial shippers, the researchers said. But by mid-century, sea ice will melt in September to the point that it is accessible every other year, on average. Choosing whether to ship through the passage “will become a coin toss,” Smith said. The predictions, however, do not foresee access beyond late summer. “This will never be a year-round operation,” Smith stressed. Smith is an authority on the ways in which climate change is affecting the Arctic, where average temperatures have risen faster than the global average since the mid-1980s. He has quantified the disappearance of more than 1,000 Arctic lakes. He also is the author of “The World in 2050: Four Forces Shaping Civilization’s Northern Future,” a 2010 book that looks at new economic opportunities, as well as environmental degradation, taking shape in the northern quarter of the globe. With Stephenson, Smith has calculated the toll global warming will take on Arctic ice roads and the communities and businesses that depend on them. “No matter which carbon emission scenario is considered, by mid-century we will have passed a crucial tipping point — sufficiently thin sea ice — enabling moderately capable icebreakers to go where they please,” Smith said. “The Arctic is a fragile and dangerous place,” Smith said. Now YOU can join the new fleet of Arctic Pirates now assembling along the coast of Canada and Russia.